Sheer finishing powder morphs into skin like special effects, minimizing pores for the look of perfect bare skin. It's cornstarch-based and light as a feather so all you'll see is shine-free skin. Perfect to use throughout the day. Contains no talc, fragrance or binders. Wear over bareMinerals foundation for a complete look for a gorgeous, soft-focus finish. With your help we can reach more people and let them know about Bare Escentuals whether this product works or not. I've been using Bare Minerals for around 3 or 4 years...I LOVE it and I'll never go back to nasty, heavy liquid foundations...ever!! It is very easy to apply...but do not use a heavy hand; a little is all you need. (I actually didn't like it at first, but as soon as I started applying less I was very pleased) It is well worth the cost, and I actually spend less than I used to on other dept. store brands, because it lasts a very long time. My skin now looks very natural all the time, and people comment frequently about how beautiful my skin is. It is very easy, and I get my face "done" in about 5 minutes or so. This makeup feels very soft and light...and it doesn't slide off my face (I live in the humid southeast). I am very fair skinned, and use the lightest color available...not in the kit. Also, the "warmth" is too dark for me, but the all over face color "true" is perfect for my coloring. If you can find a Bare Minerals store or salon/dermatologist in your area that carries the line, you can try it and find perfect colors! Ulta also carries the line. I hope this review helps! I have an extreme case of sensitive skin. I do not have acne but I got the occational bump - so I have tried everything for cleaners and make up. This makeup is fantastic - I can't use anything else because it makes my skin react. I can truly say that I look gorgeous and everyone thinks it is just my natural skin! My daughter and I went and tried this...and we both loved the product..even though she has oily skin and I have dry to normal skin..it worked so well for us both. And the thing I love the most is it's fast and simple to apply..which is a must in my life. I feel as if I'm not wearing any makeup at all..but yet my face looks so natural and even. And I love having the brushes for each application...well worth the money! 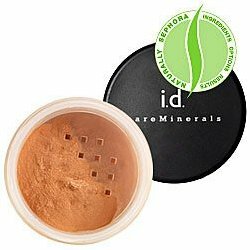 I have been using Bare Minerals for about 2 months. I am 42 and I have had oily skin since I had a hysterectomy (but no acne). The Bare Minerals do make my skin glow and when I first put it on it feels like silk. I must say, after a few hours I have to brush on more mineral veil. So I actually do this several times a day. I mix it with the foundation too when I carry it with me. I do prefer more of a coverage but not a heavy makeup. My skin is fair and so that is the only draw back for me is that it is natural. The bisque coverup is also great I can't believe how well it covers the eye area for being powder form! I'm not sure I will continue to use it because I have to keep applying it all day and I have a sheen if I apply too much. I also feel the price is probably not worth it. I am 50 and have been looking for something different. I love Bare Escentuals, have been using it for 4 months now and love the way I look. I wish I tried this long ago. I have tried a lot of makeup and have never found one that matches my skin so naturally like Bare Minerals. I started using Bare Mineral about 3 months ago and at first I thought there were too many steps and I don�t have time for this. My face has a lot of red blotchy spots and ageing spots so I have a lot to cover. But now I can put Bare Minerals on in about 15 minutes and I think having the right brush is a very important part this. My husband has always told me I look good but rarely ever told me I look beautiful and now he tells me I look beautiful all the time. I love Bare Mineral. I am delighted with bare minerals. I am woman of color and was skeptical about purchasing via the TV. I live near Beachwood, OH and visited a Bare Escentuals store. I was pleasantly suprised how well the store associate matched my skin to the correct product. I recommend this product to any and everyone who is willing to pay for it. Your skin and beauty is well worth the price. I took my sister- in-law, in Denver, to a store and she loved it too. I suggest going to a store to have a consultation for matching skin tones for women of color (A.A.) I will never use any other make up ever again. I sometimes fall asleep without removing my makeup and with bare minerals it does not matter. You're not left blotchy or patchy. They are really telling the truth about this one. I am a registered nurse and do not like a made-up look for work. They gave me exactly what I wanted. I have dry skin, dark undereye circles but not many other scarring issues. My co-workers commented that my skin "looked perfect, flawless". You can put on too much so using the correct brushes make a difference. The application process is not lengthy and after developing a routine becomes like combing your hair or brushing your teeth. I would like to tell everyone that I LOVE BARE MINERALS! Product nice but pricey and lots of silly steps! I got a boxed set from sephora for about $60. It came w/3 brushes, a cleanser, and 4 bare minerals products + a dvd. The dvd was the same as the infomercials, all the brushes and steps make it a little cumbersome. But the product itself is nice. I would recomend starting w/ 1 foundation color and warmth... then if you really like it get a brush. I am not sure what the mineral veil did. I wouldnt say it is worth $60.. it didnt change my world!